Slime molds are harmless, fungus-like organisms that use grass blades as a substrate for structural support during reproduction. 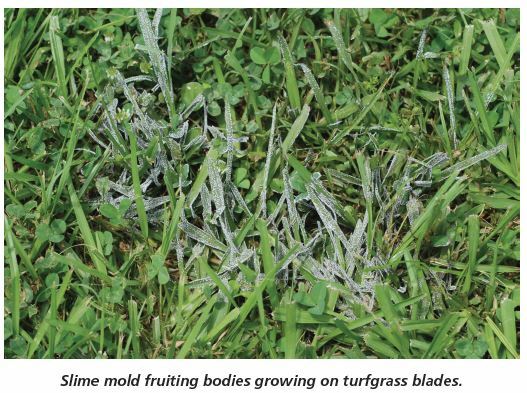 Turfgrass may appear yellow because of leaf blades colonized by slime mold. Slime molds appear as small, round balls scattered over the leaf blades, giving turfgrass an ashy or dusty-gray appearance. Slime molds actually reside in the soil. Warm, wet weather during spring and fall favor their development. They are non-pathogenic and do not obtain any nutrients from the turfgrass. However, some homeowners find them unsightly in the lawn. Warm, wet weather during fall and spring favors development of slime molds. Heavy rain followed by long periods of dry weather results in flushes of slime mold. Slime molds appear as small, round balls scattered over the leaf blades, giving the turfgrass an ashy or dusty-gray appearance. They are nonpathogenic and do not obtain nutrients from turfgrass. 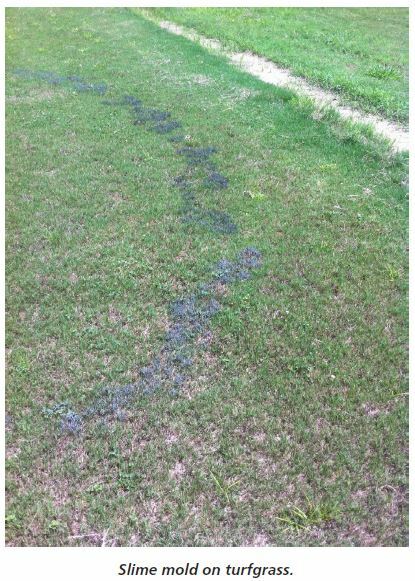 Affected turfgrass looks unsightly and may turn yellow because of slime mold shading the turfgrass leaves. Slime mold control is not necessary as most fruiting bodies disappear two to three days after first appearing. However, if desired, slime molds can be physically disrupted or removed from leaf blades through sweeping or lightly hosing off the leaves with water. If desired, a fungicide may also be used to remove slime molds. When selecting products, homeowners must purchase fungicides that are labelled and recommended for residential lawns. When using fungicides, always remember to follow the label rates and frequency of application. Fungicides containing mancozeb and sold under various trade names are listed for managing slime molds on turfgrass.